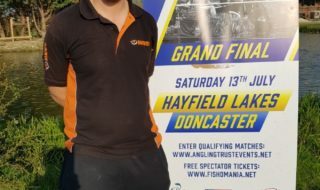 Past finalist Andy May, a professional angler from Middlewich won the 14th Fish ‘O’ Mania qualifier held at Heronbrook Fisheries, Staffordshire on Sunday 19th June 2011. Andy caught carp to 8lbs steadily throughout the match. Andy drew Canal Peg 10, which amongst others in the area has some significant past form. He set his stall out to fish tight to the far bank weed growth, where he found 4 feet of water, but decided to fish shallow as tight as he could, with a second line down the track as back up. Fishing a banded pellet to the weeds and loose feeding pellet little and often was the method that eventually paid off for him to finish the match with a winning weight of 61kg 300gr despite losing a significant number of fish in the far bank weeds. 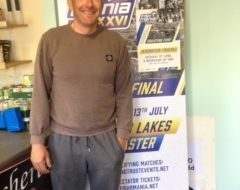 Having been runner up on a number of occasions recently, Andy openly admitted that it was a relief to go one better and qualify, and as an Angling Coach at Cudmore he must be the top favourite for the final. 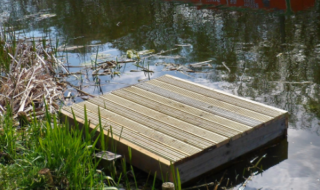 Andy said “I felt confident that I was in with a chance when I drew my peg and had a good day’s fishing. I am really looking forward to the final at Cudmore as it is my regular venue, and this will be my second time now as I first qualified at Cudmore in 2008, so can’t wait”. Second place went to Adam Rooney (Kamasan Starlets) an Account Manager from Brooklands, Manchester. 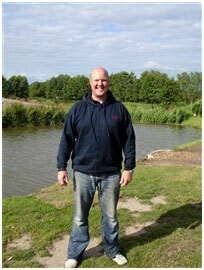 Adam was on Bridge Peg 36 behind the café, and caught F1’s, carp and barbel to 10lb to record a weight of 46kg 220gr. Using pellet on the hook and loose feeding pellet across for the first 2 to 3 hours saw him catching F1’s steadily until the peg dried up. He then switched to his inside line tight to the bank, using and feeding maggot he caught a larger stamp of carp and the odd barbel to make up his weight. Third place went to Leigh Hodgkinson (Fox Match Trentmen) a Data Engineer from Shipley, Derbyshire, from Meadow Peg 28. Leigh fished meat across and down the shelf and caught F1’s and carp to 9lb finishing with a weight of 42kg 580gr. In fourth place was Carl Sutton (C&R Kitchens and Bathrooms) from Countesthorpe, Leicestershire with a weight of 41kg 260gr, whilst fifth place went to Carl Moon from Ashbourne, Derbyshire with a weight of 41kg 220gr.